The White Knight carries the X-37 into the air. The X-37 -- an unpiloted, reusable spaceplane – made its first captive-carry flight today under the wings of the White Knight, flying above Mojave, California desert. The Boeing, Defense Advanced Research Projects Agency (DARPA), NASA-supported vehicle had undergone a systematic step-by-step pre-flight checkout. 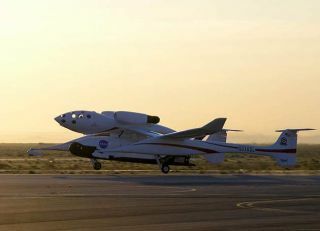 At the Mojave, California Spaceport Scaled Composites' White Knight carrier plane had previously taken the X-37 for repeated runs down the runway – all in preparation for today's liftoff and return landing of the twosome. Tagged by DARPA as an Approach and Landing Test Vehicle (ALTV), the X-37 will undergo captive carry flights, followed by high-altitude drop tests through the summer, according to DARPA spokesperson, Jan Walker. The X-37 project is exploring commercial and military reusable space vehicle market applications, be they on-orbit satellite repair to the next-generation of totally reusable launch vehicles. Today's flight of the White Knight/X-37 took place early this morning. It was one year ago to the day that the White Knight released SpaceShipOne for its first suborbital run, piloted by Mike Melville. Designed by Scaled Composites, the multi-purpose White Knight was used to haul that firm's SpaceShipOne to altitude for release. The rocket plane made a series of piloted suborbital flights last year, winning the Ansari X Prize of $10 million for back-to-back suborbital flights. No official word as yet on when the first drop of the X-37 from the White Knight is slated.